Disturbicons is an application that is supposed to offer you “emoticons with attitude,” but it only offers irritating advertisements. In order to keep your computer safe, we recommend that you remove Disturbicons. The truth of the matter is that this application has no emoticons at all. They are simply non-existent in this program. Disturbicons has no user interface and there is no way you can insert the supposedly hilarious and provocative emojis. It is plain to see that the emoticons are just a front. The developers never indented to add any emojis, since this application was set to show ads from the very beginning. Disturbicons negatively affects your browsing experience by rendering various pop-ups, banners, in-texts, and other forms of advertising. Of course, this program does not display ads simply for the sake of displaying them. Disturbicons’s purpose is to make money for its developers, who are happy to do business with shady advertisers. As you might have guessed, the ads that Disturbicons promotes might be illegitimate. We did not observe any malicious content while testing this application, but the possibility of its promoting malicious content should not be ruled out. Usually, the ads are just plain annoying with pop-ups unexpectedly blocking the view of the website you were browsing on. So it is not worth tolerating these ads, because they might get on your nerves pretty fast. Personal information can be gathered, provided that you try contacting the developers and disclose personal information such as your name, home address, and so on. Of course, one should never disclose such information to unknown entities. In any case, personal and non-personal information can be merged and used to provide customized content. By customized content we mean that they will tailor advertisements that relate to your browsing preferences. Furthermore, the gathered information is likely to be shared with other third-parties. All in all, this application is bad news. We do not recommend it to anyone. However, most people are tempted by this seemingly fun-looking program and download it from its main website at Disturbicons.com. Its download is also featured on the free software distributing website Software.informer.com. We do not know whether it can be found bundled with other software, but it is likely that at least at some point its developer Water Applications, LLC, will make arrangements to include Disturbicons in some malicious bundle. We hope that the information provided in this article was useful. It is truly a pity that users can easily get tricked by dishonest software developers who claim that Disturbicons features emoticons, but actually shows ads and gathers information for commercial gain. Therefore, we encourage you to remove Disturbicons. If you do not how to get rid of it, then consult the removal guide located below. Enter Contol Panel in the search bar and access it. 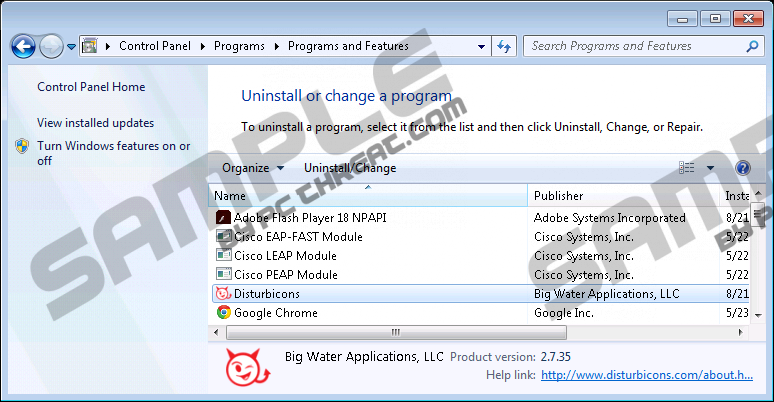 Find the undesirable program and double-click on it and click Uninstall. Find Disturbicons and double-click on it, and then click Uninstall. Find the unwanted application and double-click on it, and then click Uninstall. Find Disturbicons and click Remove. Quick & tested solution for Disturbicons removal.